The 2013 American Silver Eagle Uncirculated Coin is the sixth release in a series of coins from the United States Mint dating back to 2006. These coins are offered by the US Mint as a numismatic version of the related bullion Silver Eagles and are composed of one ounce of .999 fine silver like those bullion pieces. A release date of May 28, 2013 was used for the Uncirculated Silver Eagle. Upon that release, it was initially sold for $48.95. 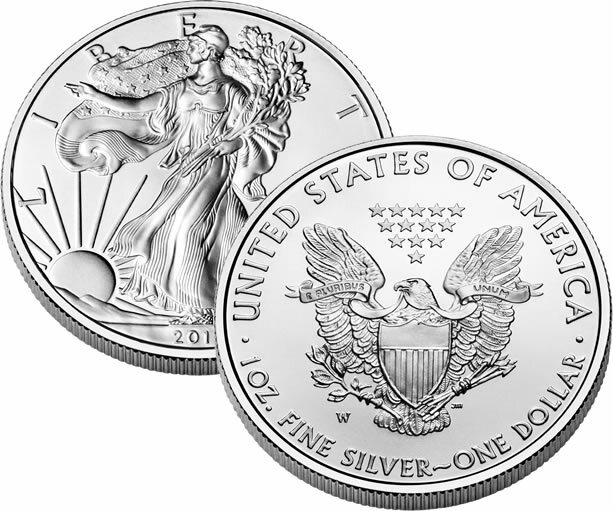 The American Silver Eagle Uncirculated Coin program has been issued annually since the 2006 debut with the exception of 2009 and 2010. Bullion demand those years forced the US Mint to cancel these uncirculated releases as it strived to fulfill the public’s interest in bullion Eagles. At the time, it was required by law to strike the bullion coins to meet demand. When originally issued, these coins are sold directly to the public by the United States Mint. Original cost of the coins contain a significant premium over and above any face or melt values associated with them as is standard for US Mint numismatic releases. Uncirculated Silver Eagles have a legal tender face value of $1. This is the value of the coin if it were to be used in an everyday commerce transaction such as at a store. To use the coin for such a transaction would be a waste, however, as it has two other values which eclipse its face value. The first is the coin’s melt value. Since each is struck from one ounce of .999 fine silver, it has a melt value approximately equal to what an ounce of silver is currently trading for. These coins also have a numismatic value associated with them. This is what the coin is worth to other collectors and generally is the highest of any values associated with the strike. Numismatic values generally increase based on the condition and perceived rarity of the coin in question. 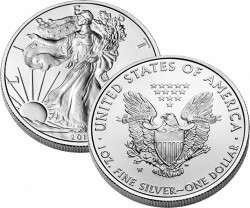 The 2013 Silver Eagle Uncirculated Coin contains the same basic obverse and reverse imagery as found on all Silver Eagles like the aforementioned bullion coins as well as the Proof Silver Eagles. These designs have remained the same since the introduction of the original Silver Eagle Program in 1986. Shown on the obverse of the coin is a "Walking Liberty" design first completed by Adolph A Weinman for the 1916-1947 Half Dollar. This design is considered one of the most beautiful ever struck on an American coin by many. Obverse inscriptions include of LIBERTY, IN GOD WE TRUST and the year of minting. John Mercanti designed the reverse which shows a heraldic eagle with shield. Reverse inscriptions include E PLURIBUS UNUM, UNITED STATES OF AMERICA, 1 OZ. FINE SILVER and ONE DOLLAR. The mintmark is also located on the reverse of the strike. The silver coins sales figures page contains current sales numbers for the Eagles, when available. Melt values for the strikes based on the current silver market are also shown.